Wow, I was given my first award! How exciting! 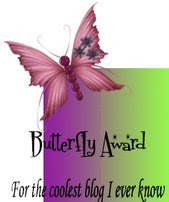 Thank you, Julie, for sharing the "Lovely Award" and the "Butterfly Award" with me. I appreciate your kindness. Julie had posted a fantastic idea on her site as a way to remind President Obama about the evils of abortion. I will be shopping for my red envelope this week. I'm finding I'm having a difficult time posting lately, for two primary reasons: lack of time and lack of inspiration. Lack of inspiration is likely partially due to being so tired and worn down. So for a little while, my posts may be sporatic and fairly infrequent, but please do check back. Reading one of Tracy's posts reminded me of a prayer I LOVED when I was in college. It is wonderful to take it out and pray it again! I have watched the entirety of the movie Finding Forrester many times for the closing scene. For me, the climax of the movie is not necessarily where the producer meant for it to be but in an often-enough quoted portion of a letter William Forrester wrote to his young friend, read as the movie is drawing to a close: "We walk away from our dreams, afraid we may fail, or worse yet… afraid we may succeed."